Eileen Karmy is a 3rd-year PhD student at the Music subject area, researching unionized musicians in early 20th-century Valparaíso. 15 June 2017 marked the 40th anniversary of the Scotland national football team playing Chile at the National Stadium in Santiago. Because of all the controversy this match stirred up, it later became known in Scotland as the “Match of Shame”. With Scotland winning 4-2, the political controversy behind the game was barely noticed in Chile. With press censorship dominating at the time in Chile, the local newspapers just mentioned that some “internal political issues” were taking place in the UK regarding this football match. Forty years had to pass for Chilean people to know about the “Match of Shame”, and the Janey Buchan Political Song Collection of the University of Glasgow has something to do with it. I learned about the “Match of Shame” from John Powles, the JBPSC’s archivist. In January 2016 he taught a class at the Popular Music Politics course, which I was coincidentally attending, and he show the song “Blood upon the Grass” by Adam McNaughtan. The song struck me. Not just because is a about something that happened in my country, but also because it describes a historical event that I had never heard about it before: the campaign of the Scottish people in solidarity with the Chileans after the coup d’état of 11 September 1973. From the People’s History Museum. Adam McNaughtan wrote “Blood upon the Grass” as the Scottish football team travelled to Chile to play a friendly match before the 1978 World Cup in Argentina. Those were bloody years in many South American countries, ruled by ruthless dictators supported by the CIA and other international bodies. It is in this context the songs asks the Scottish football players if they will go and play in Chile, in the same stadium that after this 9/11 was turned into a detention and torture centre. The song also accuses the players saying that if they do so they “will help the Junta’s dark disgrace”, because in that stadium “there’s blood upon the grass”. The song also recalls Víctor Jara’s murder, which happened 44 years ago this September. Jara was a well-known folk singer, one of the emblematic musicians of the Chilean New Song movement and supporter of Allende’s socialist government. Adam’s song connects the tortuous moments that Víctor Jara lived while we was detained in the Chile Stadium with what the Scottish football players will find during their stay in Santiago de Chile. In fact, in a recent interview Alan Rough, the goalkeeper, said: “the most memorable thing I remembered was going to the dressing room and seeing the bullet holes on a wall where they killed people”. The song does this connection quoting part of the poem that Jara wrote during his last moments: “Somos cinco mil” (We are five thousand”), which can be found at the JBPSC. 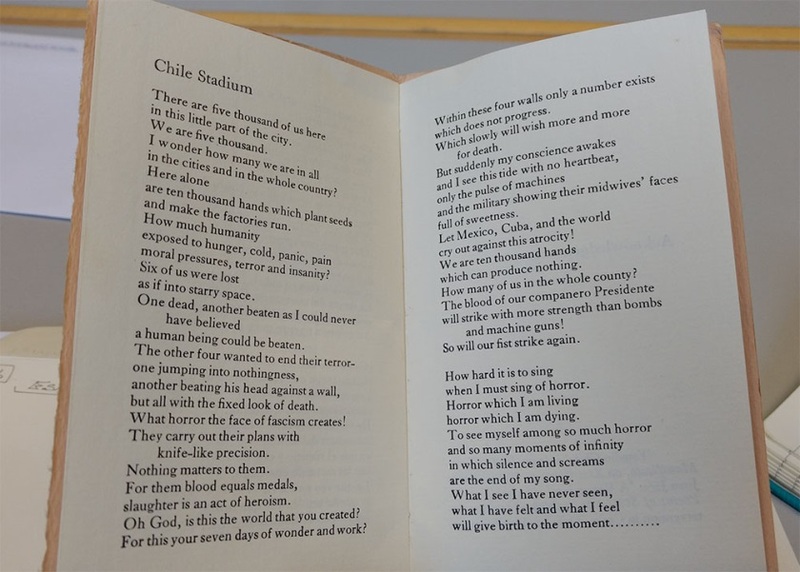 Estadio Chile, the last poem written by Víctor Jara. This leaflet is hosted in the JBPSC. Although Víctor Jara was killed in a different stadium (Chile Stadium, now called Victor Jara Stadium, and the match was held at the National Stadium), the meaning and the power of the song remains. To me the song was also a window to learn more about this event, particularly how some campaign groups in the UK pleaded with their government and the SFA to withdraw the Scottish football team from this game in solidarity with the Chilean people. Listening to this song invited me to search for more information about it. I spent a few hours at the JBPSC looking for documents and also chatting with John Powles about this. The Political Song Collection holds loads of papers, leaflets, records, and scores about political song, with just a few of those records being about Chile. But those few records mean two main things to me. Firstly, the bloody civil-military dictatorship that my country experienced from 1973 to 1990 was so dramatic that it attracted the attention of people from all across the world. And secondly, that countries that can be so different in several ways, such as Chile and Scotland, can be very well connected by people in international solidarity movements. The Scottish solidarity movement towards Chile was reflected in this Adam McNaughtan’s song. Helping me learn about this was Dr John Williamson (who teaches the Popular Music Politics course). He kindly let me borrow all the press accounts that he gathered about the “Match of Shame” and the political controversy that took place in the UK. I shared what I learnt with a Chilean friend, a music journalist, who is also a football fan. He was happy to write a piece about this for the newspaper that he works. The piece was published by the end of June, to commemorate the 40th anniversary of this shameful football match. As football is so popular, the piece reached a lot of people in Chile who become interested in the story behind the game. I dare say that none of them knew about the solidarity campaign that the people in Scotland started to stop the “Match of Shame” and challenge the white-washing international image of the civil-military dictatorship in Chile. The piece was reposted in social media, quoted in other digital newspapers, and even a TV channel interviewed me at prime time in the news’ football section. After 44 years of the Pinochet’s dictatorship, Chile still has a lot to learn, to clarify, to forgive and to never forget. There are still people missing, people who lost their loved ones and still don’t’ know what happened to them, people who are still waiting for justice, and people who still live in exile. Some of them still live in Scotland, thanks to supportive people who helped them to get shelter and asylum. Some of their names are in the JBPSC documents, such as musician Carlos Arredondo who is now based in Edinburgh after fleeing his country in 1973. This photography is an example of this: this is the Chillán Folk Group with Michael Foot in a solidarity event where this band performed in 1974. 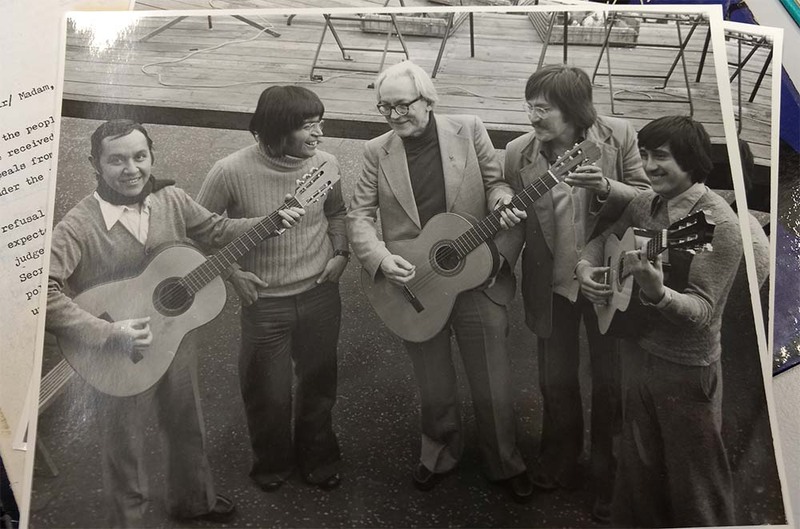 Carlos Arredondo (second from left to right) and his Chillán Folk Group with Michael Foot in Refrew 1974. Personally, and on behalf of my older compatriots, I am grateful to all of those who helped the Chilean people after the 1973 coup and supported them through international campaigns of solidarity, including Adam McNaughtan, who through his song revealed the links between both countries. As a music researcher, I am grateful to the all the people involved in the Janey Buchan Political Song Collection, to John Powles and John Williamson, for keeping all these documents which help to preserve part of my country’s memory.